We offer both in gym Barbell Club for Wichita Falls area locals as well as online coaching and programming. Our gym houses competitive powerlifting equipment such as an IPF platform and Texas Strength Systems competition rack as well as IPF approved barbells. During Barbell Club hours everyone training will receive group style coaching along with their individual and team programming. Our online barbell club is full of the same benefits as our in gym barbell club including the expertise coaching. Both programs offer a spot on our USAPL competitive team. 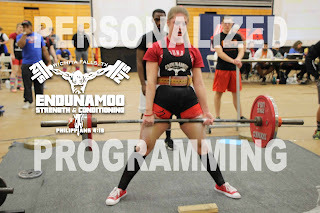 After your first introduction month you will join our growing team of powerlifters who receive monthly workouts guiding them towards being the strongest individual he or she can be. You will also receive access to our private facebook group where our coaches can watch your lifts and give you technique assessment. this will also provide us the oppurtunity to Micro-adjust your accessories to best benefit you. Perhaps you have weak lats and need more back development? Perhaps your weak and hurting back is due to weak and inactive glutes? Either way we will help you improve. Cost: $40.00 per month auto drafted the first Monday of each month. Not everyone wants to simply improve their squat, bench, and deadlift. Your goals can range from having a double body weight clean and jerk, to simply wanting to make a local college club team for ultimate frisbee. Either way, we can help program strength and conditioning for your needs. Because of this personlization, we require more time and energy to communicate with you - but with that comes faster and more specific results. Cost: $120.00 per month auto drafted after the first Monday of each month. Community is a bigger component of life than people will ever understand. Having someone who will cheer you on, build you up, and guide you towards your goals is an underestimated value. We understand it's worth. By applying for our online barbell club you will receive personalized monthly programming, online group support, weekly technique assessment, reduced pricing on our gear and merchandise, free endunamoo barbell club gear, and most importantly you get to be a part of a team that will get you from where you are to where you can be. 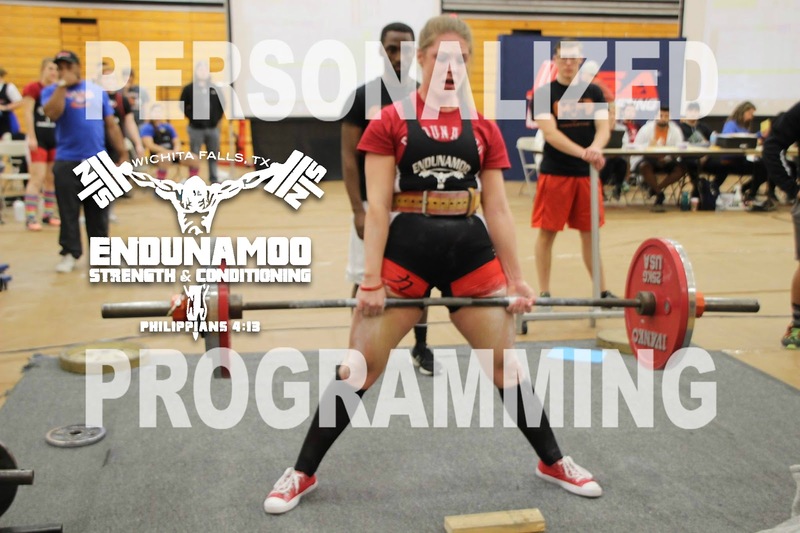 All programming is written by a Board Certified Exercise Physiologist and degree holding Exercise physiologist who is also the coach of Midwestern State University's powerlifting club team. 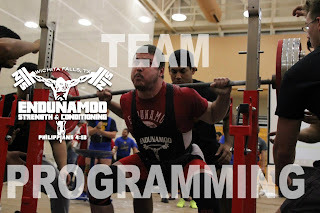 The online group has over a decade of powerlifting experience helping with technique, 2 State Championship medals, Over 20 medals earned in the past 2 years alone, and 5 Texas state records. More important than our records and medals is our moral and spiritual obligation to each other and our savior. We take the be humble have hustle approach to competing in this sport. Endunamoo is the greek work for to be endowed strength and it's found in the verse Philippians 4:13 "I can do all things through Christ who strengthens me." If you're interested in joining our barbell club please Email us at Endunamoox@Gmail.com or feel free to input your information above and we will contact you within 24 hours.